Friends, I can't be the only one who left their significant other's gift for last. I just got so caught up in buying for out of town family, that I ALMOST forgot my husband. Whoops! Dave and I actually decided to get each other a joint gift (a dustbuster... #marriedlife), but I want to get him something small too. These gifts will work for your husband, wife, girlfriend, boyfriend, partner, whoever! 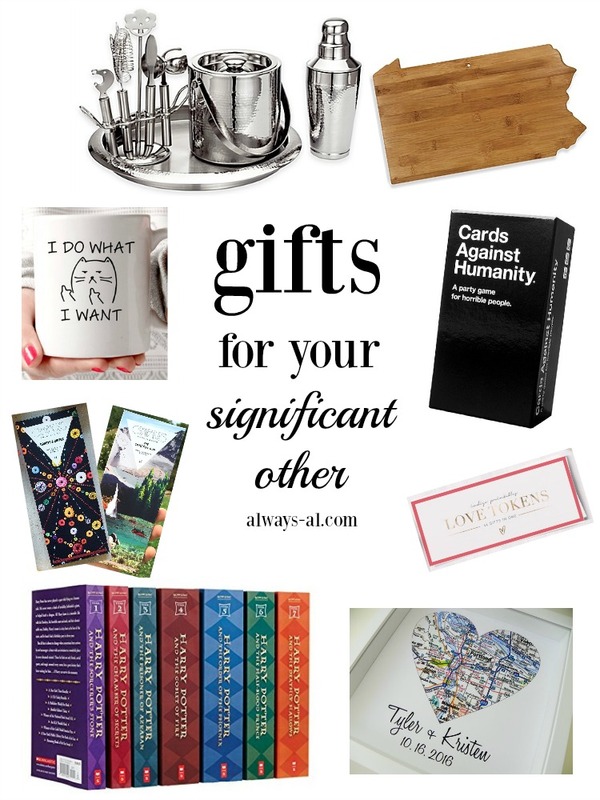 These are all very generic gifts, some of which can be personalized if that is your thing. So I'm just going to throw it out there that the Harry Potter set is only $50 right now! That is less than $10 per book, AKA a steal!! And I think we may be the last household on the earth to own Cards against humanity. I usually try to get a board or card game for Dave every year, and this might have to be it this year! We have that bar set, and it is SO NICE. Everything that you could need for cocktails is included, and it is so simple with the hammered steel. Love it.